Lancaster Station Traffic Investigators are looking into the circumstances of a fatal hit and run that occurred on Saturday, June 23, 2018 at approximately 12:53 A.M. at the intersection of Avenue J at Andale Avenue in Lancaster. Information gathered at the scene indicates a pedestrian was struck by an unknown vehicle, while in the roadway on Avenue J. The unknown vehicle was traveling west on Avenue J and it fled the location in an unknown direction. Vehicle debris found at the location indicates the suspect vehicle may possibly be a 2002-2007 “C” class Mercedes, sport edition with wide tires. 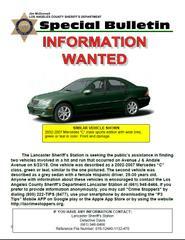 The vehicle is possibly green or teal in color. The vehicle will have front end damage, possibly towards the left side of the vehicle. Witnesses at the scene state a second vehicle, grey sedan, hit the pedestrian while she laid in the roadway. The grey sedan initially stopped at the collision scene before fleeing the location heading west on Avenue J. The witness states the grey sedan was occupied by a female Hispanic adult driver, 25-30 years old, and a female Hispanic adult passenger, 25-30 years old. Information gathered indicates the grey sedan was the second vehicle to hit the pedestrian. This information is still being investigated and verified. Anyone with information about this incident is encouraged to contact the Los Angeles County Sheriff’s Department’s Lancaster Sheriff’s Station at (661) 948-8466 or Detective Matthew Davis at (661) 661-3810. If you prefer to provide information anonymously, you may call "Crime Stoppers" by dialing (800) 222-TIPS (8477), use your smartphone by downloading the "P3 MOBILE APP" on Google Play or the App Store, or by using the website http://lacrimestoppers.org. * Lancaster Sheriff’s Station polices the City of Lancaster, Antelope Valley College in Lancaster, and the unincorporated communities of Antelope Acres, Lake Los Angeles, and Quartz Hill in the Antelope Valley.